Gunman Vester Flanagan's Twitter, FB profiles: Why they shouldn't have been taken down. 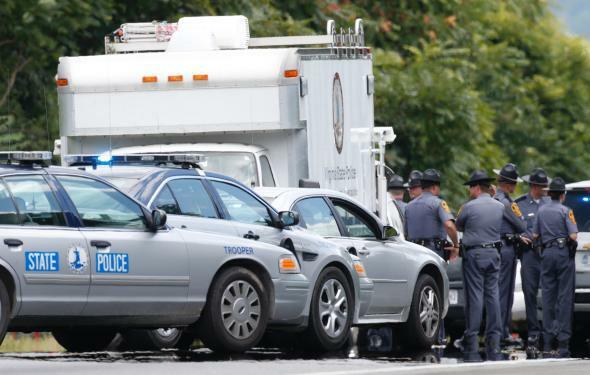 Twitter, Facebook, and LinkedIn Took Down the Virginia TV Shooter’s Profiles. They Shouldn’t Have. Virginia State Police vehicles line the edge of Interstate 66 in Fauquier County, Virginia, where Vester Flanagan shot himself several hours after he shot and killed two television journalists during a live broadcast on Wednesday. Around 11 a.m Wednesday, we learned that Vester Flanagan, the main suspect in the on-air shooting deaths of two Virginia television journalists that morning, was allegedly posting to Twitter as he fled. The Twitter account @bryce_williams7—Flanagan, himself a television journalist and former co-worker of the victims, was known professionally as Bryce Williams—featured several personal remarks about the journalists who had been shot. “Alison made racist comments,” one post read, in apparent reference to shooting victim Alison Parker. “Adam went to hr on me after working with me one time!! !” read another, apparently referring to victim Adam Ward. Then, as if to confirm his identity, @bryce_williams7 posted a brief video of the attack taken from the shooter’s point of view, and noted that the clip was also available on his Facebook page. The video was graphic and horrifying. And, by 11:23 a.m., it was gone. So was everything else on the @bryce_williams7 account. At that point, with no forewarning or explanation, Twitter suspended the account, thus preventing the user from posting anything else and preventing the public from seeing anything that had been posted before. 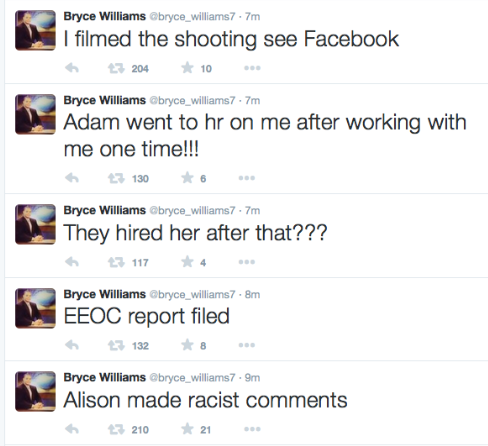 Soon thereafter, the Facebook and LinkedIn profiles allegedly belonging to the same Bryce Williams had also been suspended. Key sources of information about the main suspect in a major crime, apparently being offered by that very suspect, had disappeared from the Internet. The video was chilling, and I can understand why Twitter and Facebook hastened to remove it. The slain victims are real people who deserve to be treated with dignity, and that fact alone provided sufficient justification to remove the clip. But the decision to suspend the Bryce Williams accounts entirely seems less a matter of granting the victims dignity and more about not wanting to give offense. Every news organization and social media platform observes certain standards of decorum and decency. But sometimes odious material is of great value in understanding the news. Even as the events seemed to still be unfolding, Twitter, Facebook, and LinkedIn should have left the accounts up. So far the companies have offered no public explanation of why they decided to suspend Williams’ profiles. Police may have asked them to do so, though I doubt it, given the brief interval between when the profiles began to attract wide notice and when they were removed. More likely, Twitter and Facebook removed the profiles of their own accord, because of the graphic material posted there and a reluctance to give a suspected murderer a platform. (As for LinkedIn, the job-history network presumably wanted to prevent Williams from using its blogging function.) They may have also wanted to deny Williams the sort of notoriety that might spawn copycat killings, but that’s a weak argument, given that Williams’ face has been plastered all over the television news channels all day. The scrubbings aren’t surprising—Facebook and Twitter are usually very quick to remove the profiles of alleged shooters—but they are disappointing. It’s understandable that these companies wouldn’t want to abet a suspected murderer’s message or otherwise give offense. With their takedowns, however, they prevented the public from accessing information pertinent to real-time news stories. In its pre-emptive strike, for example, LinkedIn also scrubbed valuable information about the suspect’s employment history. Like it or not, Twitter and Facebook are vital news sources in breaking-news situations, and they should not feel compelled to act in loco parentis. The information found on those accounts was useful for people who were following and trying to understand this story—and will remain so to those trying to access the historical record of these events in the future. Removing that information from social media doesn’t stop people from wanting to see it; it just makes them work a little harder to find cached copies of it. The fact is that the information posted to the Bryce Williams social media accounts has informed much of the subsequent major-media reporting on the story. The implication that journalists can benefit from this information but the public needs to be shielded from it is offensive. And while Facebook and Twitter have been known to suspend and ban accounts that engage in abusive behavior, there is a qualitative difference between silencing hate speech and silencing the speech of a man who has allegedly done a hateful thing. A Fox News guest this afternoon noted that social media gives killers an opportunity to get their message out. And indeed it does. But the shooter already got his message out with a gun and bullets. Any subsequent social-media justifications of the act are far less dangerous and offensive than the act itself. If “their message” lends context to a story in progress, then as a journalist and a consenting adult, I want to see it. The content of the postings might be offensive, but so is Twitter’s apparent conviction that I need to be protected from unpleasant speech.